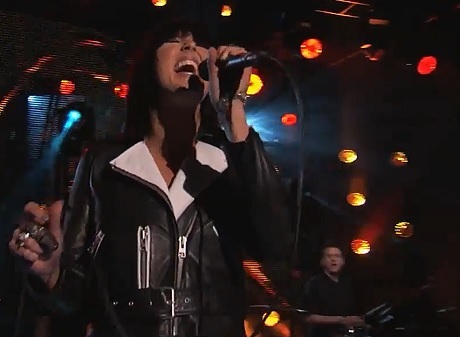 With Phantogram's Voices hitting stores yesterday (February 18), the New York synth-pop duo were in full celebration mode when they stopped by Jimmy Kimmel Live! to play a couple tracks off the LP. The televised broadcast of "Fall in Love" had singer Sarah Barthel stomping around the front of the stage as she hefted out her swoon-worthy, relationship-geared vocals. A pair of backup musicians held down drumming and synth duties, while Josh Carter deftly punched out a series of sounds out of a sampler. The group also ran through equally infectious "Black Out Days," though this time with Carter adding electric guitar to the poppy proceedings. You'll find videos for both performances down below.